Your primary character is Maester Aemon. You are both wise and humble. You don't seek the limelight, preferring to use your gifts as an adviser and confidante to the powerful. You have a strong sense of duty, but of duty to the greater good rather than to those to whom you are close to personally. You prefer to serve people rather than leading them. You are gentle and kind in all of your dealings with others. You are driven from within and do not seek the approval of others. Your secondary character is Maester Luwin. You are compassionate and intelligent. You take your work seriously but sometimes can be irritable if disturbed. You believe everyone has goodness in them, including those who have hurt you. You place a high premium on honesty and loyalty. You are dutiful and a reliable, trustworthy servant. You do not seek the trappings of power for yourself but are called upon by the the influential and powerful to advise on matters of importance as you opinion is greatly valued. Your tertiary character is Jeor Mormont. You are strong and formidable. You are fearless in the face of adversity and face your problems head on. You are serious and respected by those around you because of your strong sense of loyalty, honor and duty. People trust you because you can be relied upon to keep your word and deliver on your promises. You don't seek out power for your own enhancement, but serve and wield power for the benefit of all. You don't suffer fools gladly and have a no-nonsense approach to life. Your primary character is Jeor Mormont. You are strong and formidable. You are fearless in the face of adversity and face your problems head on. You are serious and respected by those around you because of your strong sense of loyalty, honor and duty. People trust you because you can be relied upon to keep your word and deliver on your promises. You don't seek out power for your own enhancement, but serve and wield power for the benefit of all. You don't suffer fools gladly and have a no-nonsense approach to life. Your secondary character is Robb Stark. You have a keen sense of honor and justice. You are fair and compassionate and place a high priority on keeping your family safe. You show determination in the tasks you take on, and often surprise others in the manner in which you achieve your goals. Generally others underestimate your intelligence and this provides you with the opportunity to surprise those around you. Your weakness is in diplomacy and political skills as you're a straight talker who likes to speak truthfully and directly. Your tertiary character is Mance Rayder. You are a charismatic, calm, and determined man with strong leadership qualities. You tend to rise quickly through the ranks of any organization you enter. You have good social and diplomatic skills, allowing you to collaborate with many different types of people. You have an honest yet stern persona which earns you respect and admiration of those around you. You are very trusting which can be your greatest weakness. You value freedom above all else. Your primary character is Maester Luwin. You are compassionate and intelligent. You take your work seriously but sometimes can be irritable if disturbed. You believe everyone has goodness in them, including those who have hurt you. You place a high premium on honesty and loyalty. You are dutiful and a reliable, trustworthy servant. You do not seek the trappings of power for yourself but are called upon by the the influential and powerful to advise on matters of importance as you opinion is greatly valued. Your tertiary character is Catelyn Stark. You are proud, strong, kind, and generous. You are seen as honourable and upright by acquaintances, holding duty over desire as a governing principle of behaviour. You also have a strong grasp of politics and can act with diplomacy and tact. You are also fiercely protective of your family. You often follow your heart rather than your head, especially when it comes to your family. You're honest and brave and understand that sometimes sacrifices need to be made for the greater good. 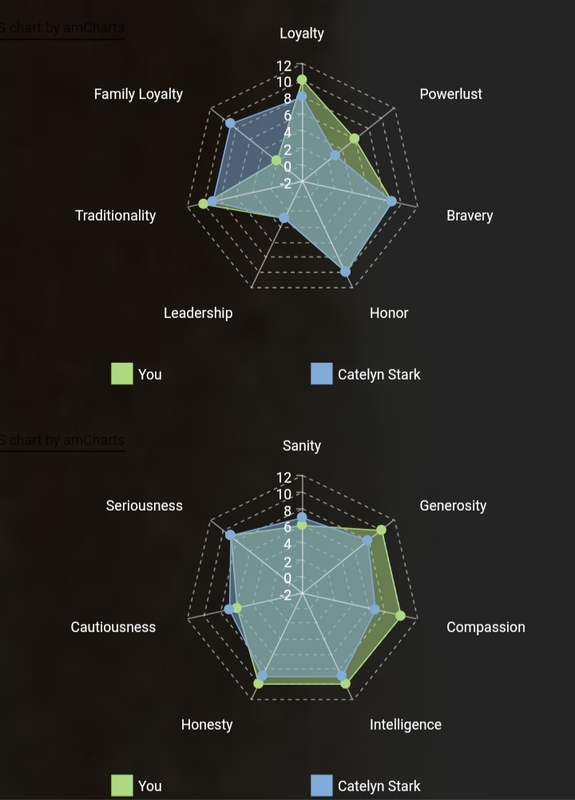 Your primary character is Catelyn Stark. You are proud, strong, kind, and generous. You are seen as honourable and upright by acquaintances, holding duty over desire as a governing principle of behaviour. You also have a strong grasp of politics and can act with diplomacy and tact. You are also fiercely protective of your family. You often follow your heart rather than your head, especially when it comes to your family. You're honest and brave and understand that sometimes sacrifices need to be made for the greater good. 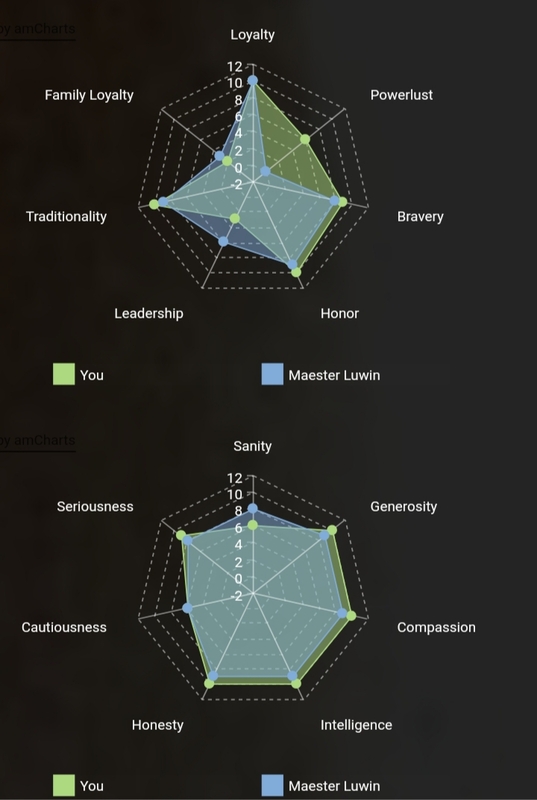 Your tertiary character is Ser Rodrik Cassel. You are fiercely loyal to the people whom you deem worthy. Courage is another quality that you have in great abundance. While other may choose their words carefully, you have a tendency to speak your mind plainly and loudly, even though this sometimes gets you into trouble. You are not a natural diplomat but you are dutiful and can be relied upon to keep your word even in the most testing of circumstances. Had to take the quiz twice. I don’t who “ Master of Coin” is. But I do him as both Baelish and Little Finger. Your primary character is Ser Rodrik Cassel. You are fiercely loyal to the people whom you deem worthy. Courage is another quality that you have in great abundance. While other may choose their words carefully, you have a tendency to speak your mind plainly and loudly, even though this sometimes gets you into trouble. You are not a natural diplomat but you are dutiful and can be relied upon to keep your word even in the most testing of circumstances. Your primary character is Robert Baratheon. You're brave, generous, compassionate, honorable, loyal, honest and traditional - a veritable laundry list of good qualities for those seeking power. However you lack in leadership and intelligence, sometimes unable to get others to follow you, and sometimes falling victim to traps that others have set for you. However, you're as well liked as you are charming and outgoing. You have a remarkable ability to turn enemies into friends. Sometimes you enjoy yourself a little too much losing focus on the things that matter in pursuit of simple pleasure. 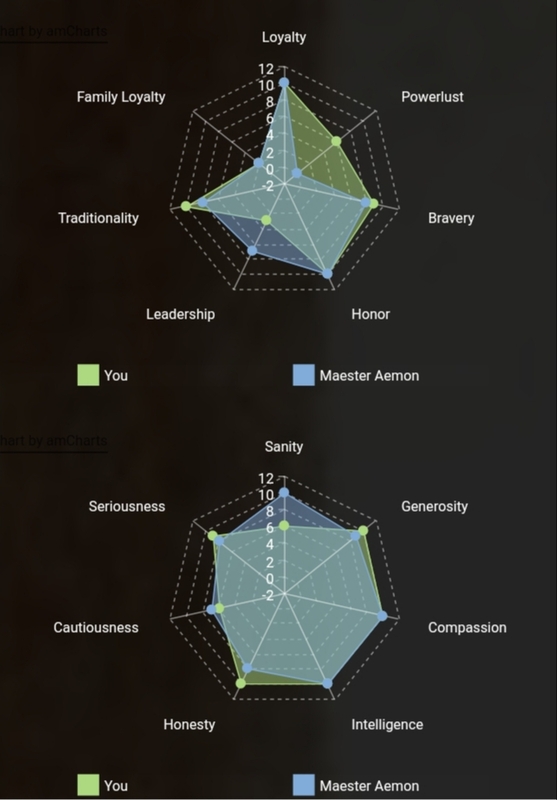 Your secondary character is Ser Rodrik Cassel. You are fiercely loyal to the people whom you deem worthy. Courage is another quality that you have in great abundance. While other may choose their words carefully, you have a tendency to speak your mind plainly and loudly, even though this sometimes gets you into trouble. You are not a natural diplomat but you are dutiful and can be relied upon to keep your word even in the most testing of circumstances. I don't watch GoT but I took it anyway. Your primary character is Tywin Lannister. You are smart, intimidating and ruthless. You are primarily concerned with your power and legacy, putting elaborate plans into action to promote and protect your interests. You believe that your family is the most important thing in the world but only in so far as it secures your legacy. This leads you to be controlling, and sometimes cruel. You protect your honor and name, but you prefer to be feared rather than loved, and so compassion and generosity are not important qualities to you. Your secondary character is Olenna Tyrell. You have a sharp tongue, and rarely shy from using it to state your opinions. You've got a wicked wit and can be extremely cunning in executing your plans. You'll mock members of your own family, though this might be due to a lack of patience with them, as you are strongly loyal to your family. You're known for your wisdom and pragmatism. Others, especially family members will seek your advice and counsel before embarking on a course of action. Those outside your family are careful not to get on the wrong side of you. Is this accurate? Your tertiary character is Ser Alliser Thorne. You are a sober, loyal person and take your duties and responsibilities very seriously. You have seen much pain and suffering in the world, and have a hardened heart because of it. You are skilled and have leadership qualities but you have difficulty taking criticism and sometimes bully people who are inferior to you. You don't value compassion and generosity as qualities, but rather toughness and strength. Wow. Great test! I'm only about 3 seasons into the show, so some of the references were lost on me. Your secondary character is Davos Seaworth. Some people say you're the most honorable, brave and loyal person they know. You don't naturally seek power nor prestige for yourself, but you're a trusted right hand man for those in positions of power. You are the voice of reason to the people who lose their way and your counsel is valued and sought. You give honest advice even when it may not be well receive - you speak truth to power. You always seek to add to your knowledge and improve yourself. I shared to facebook, then clicked the link. It showed all the info and graphs. Your secondary character is Osha. You are uncomplaining and adapt easily to new situations. You may be tough but you have learned to be compassionate to the people who rely on you. You're both cautious and brave, an unusual combination that allows you to choose your battles and means you usually survive to fight another day. You're slow to trust others, but can be very loyal once your trust is won. You are fiercely protective of those in your care. Your tertiary character is Ser Jorah Mormont. You have a complex character. While you are a moral person and always try to be honourable, you sometimes take dishonourable courses of action out of love or expediency. You're stoic, short-spoken and sometimes cold but you do have the ability to warm up to people once they earn your respect. You're prone to latch on to others that you particularly respect. It is in the service of such a person where your greatest loyalty and bravery is seen. Your secondary character is Robert Baratheon. You're brave, generous, compassionate, honorable, loyal, honest and traditional - a veritable laundry list of good qualities for those seeking power. However you lack in leadership and intelligence, sometimes unable to get others to follow you, and sometimes falling victim to traps that others have set for you. However, you're well like as you are charming and outgoing. You have a remarkable ability to turn enemies into friends. Sometimes you enjoy yourself a little too much losing focus on the things that matter in pursuit of simple pleasures. [SJ] For SJ's only, who are your favorite Game of Thrones TV show characters?